In Lyra, the first decan of Sagittarius, we saw the theme of praise. We now see the contrasting theme of judgment in Ara. This is one of the “chambers of the south” of which Job refers to in Job 9:9. 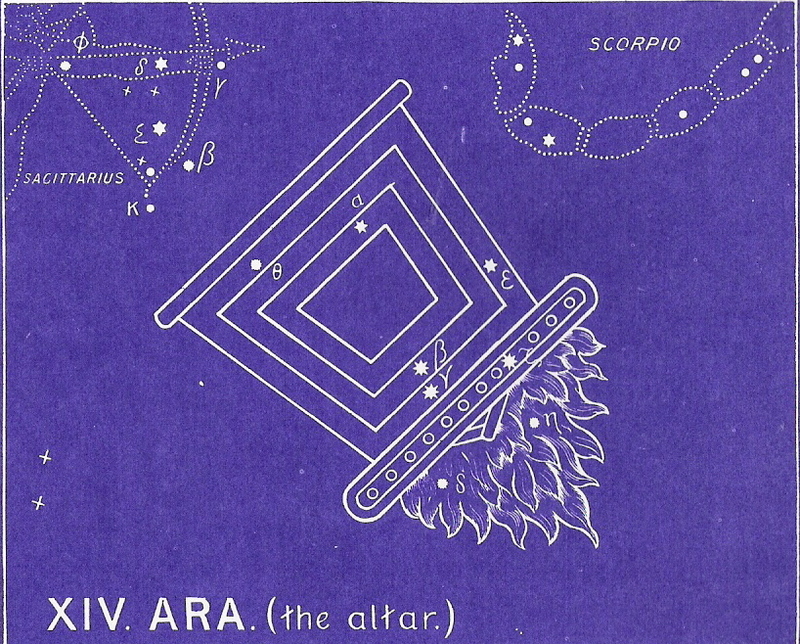 When Ara was originally drawn, it was visible from only the southernmost regions of the northern hemisphere. (See The Chambers of the South page for more information.) In the Egyptian picture the altar is replaced with a man upon a throne who holds a flailing whip in his hand. His name is Bau which means “He comes.” Very little mythology is associated with this sign; however, the FORNAX phonomenon is seen here. (See The Chambers of the South page for more information.) 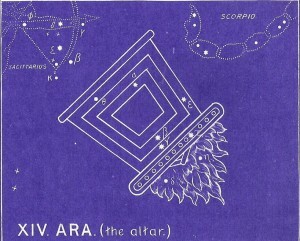 It has long been rumored that somewhere in the southern chambers there was the end of judgment — a Lake of Fire into which Eridanus flows and Ara is poured out. These southern constellations are fascinating because they give insight into many of Christianity’s most awesome mysteries, not the least of which is the truth of God’s ultimate judgment on sin. This is a picture of an altar that is turned upside down, as if it is being poured out and emptied. It is symbolic of the full sufficiency of the sacrifice offered by Jesus. What He did once need never be done again. We see the completion of Jesus’ coming as a suffering servant in this constellation. He came in humiliation to die for those whom He loves. To truly save them, He suffered all that was due a meritless sinner who is incapable of saving himself or earning favor with a Holy God. But that is only part of the full picture of God’s activities as Judge. He will judge every particle of creation because He has earned that prerogative by virtue of His suffering. All of creation will be subject to His just and inscrutable judgment. To continue in the correct order of the ancient star chart, please select Drago next. And be sure to download our free e-book that discusses the evidences for this amazing star revelation!